September is coming and with that, cooler evenings and Brownies and Guides starting up again. I remember going for mini-hikes in the woods with my Brownie pack, carrying make-shift lanterns we made with sticks and empty jam jars. Ours had little tea lights, but I thought the Second Life version would be cuter with nano-sized, almost transparent, glowy night moths. Lost in the woods? 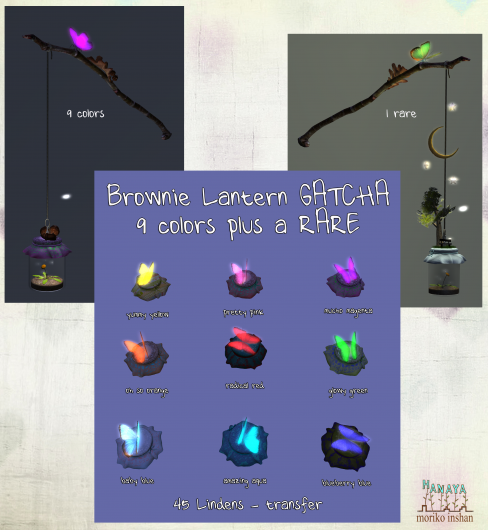 You need a -Hanaya- Brownie Lantern. Nine yummy colour lid + butterfly combos, with a half dozen miniature glowy flybabies in a jar. And a dandelion. Attached to a dried and creaky oak branch. With an oak leaf and some acorns too. Try your chances at getting your fave colour or the special rare one. 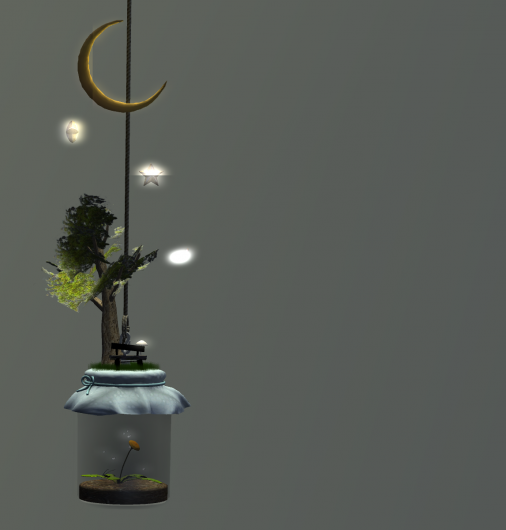 The rare lantern is topped with a little home for fairies, complete with bench and a magic mushroom. And of course, the moon and the stars. So wait until dusk, grab a lantern explore the woods of your imagination. This entry was posted in Product Announcements on August 17, 2012 by moriko. It has been about 6 months since -Hanaya- has participated in a hunt, but when Chic Aeon asked us to join a small group of stores for her If I were Rich Hunt, the timing was just right. I had just completed an extravagant marble fireplace for our Summer Romance line of products, and it seemed that it would make a perfect hunt gift for the avatar who has everything. 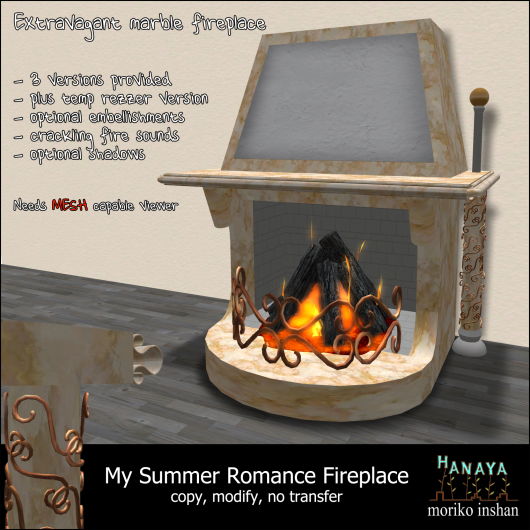 My Summer Romance Fireplace is a one-of-a-kind marble piece created in mesh, with sculpted embellishments and log fire. It comes packaged in 4 variants – one of them being a temp rezzer version that only uses 1 prim. Soft crackling sounds and glowing embers set the mood for romance and the sculpted flames are reflected in the polished surface of the marble hearth. If you prefer, set out the version of the fireplace without the log fire, and fill the fireplace with flowers. Above all, enjoy it with a friend or loved one. This entry was posted in Events, Freebies and Gifts, Product Announcements on August 15, 2012 by moriko. -Hanaya- brings vintage summer romance to Second Life at Vintage Fair 2012. Inspired by a recent vacation in Bellagio and Venice, My Summer collection from -Hanaya- is all about indulging your senses. Heaps of ruffled pillows, sumptuous fabrics, distressed romantic woods, gilded metals and the scent of old fashioned David Austin roses. 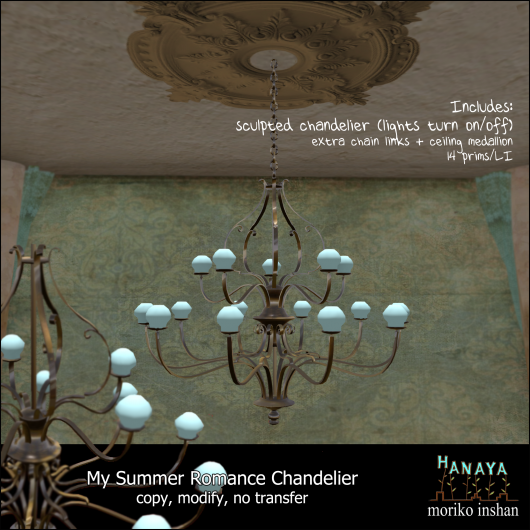 The Summer Romance bed from -Hanaya- has two looks – Daytime and Nightime, both accessible from a simple to use menu. The daytime look is dressy with tons of fluffy pillows and a tidy bed. One click of a button transforms the bed into a comfy nest with scrunched up pillows and messy bedding. You and your partner will enjoy the 28 animations that let you relax with a book or laptop, cuddle up, kiss and sleep. Most of the bed’s animations work best with 2 individuals, although a few work well with a single avatar. Also included is a ruffly matching stool with 2 animations. Matching bed tables, a long dresser and vintage botanical wall prints are available separately. 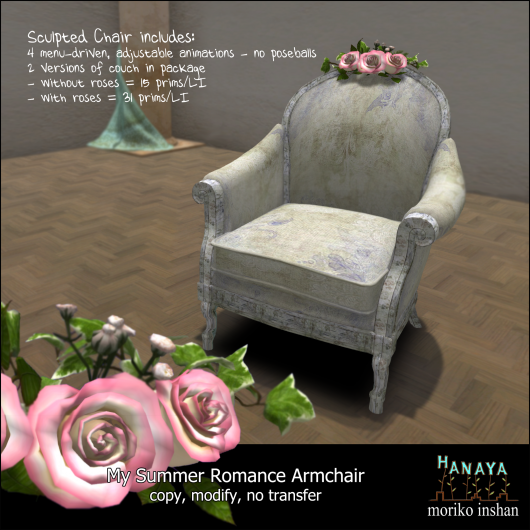 Get ready for the delicate the scent of roses when you purchase the Summer Romance Couch or the Summer Romance Armchair. Both include menu-driven animations (12 in the 3-seater couch, and 4 in the chair), and are also provided in a lower prim version without the roses. The furniture is copy, modify – like most our products, so rez as many as you wish and modify textures or size as needed. Our butter cream three tier wedding cake is covered with white fondant icing, embellished with roses, and has a strawberry filling – perfect for a summer wedding. The cake itself contains a ‘Cut the Cake’ animation for couples and gives you a cake knife when you start to cut. A cake table (see image) is included. When the table is touched, your guests will receive a fork + piece of cake which includes an eating animation, allowing them to join in your celebration. To complete our brand new Vintage Fair 2012 product release is a set of MESH Vintage Keepsake boxes with yummy scalloped edge lids, and a brass version of our popular chandelier. The keepsake boxes are also available individually. So please come and visit us at the Vintage Fair on the Retro sim. The event opens today at 4 PM SLT. To reduce script limits at the Vintage Fair, we have made a fully functional display model of our new releases available for demoing at our in-world store (2nd floor furniture department). This entry was posted in Events, Product Announcements on August 4, 2012 by moriko. To celebrate my real life birthday, which is tomorrow, we decided to bring you guys something extra cute and sweet as a group gift for the month of August. And better yet, the -Hanaya- Yummy Collectibles group will be free to join from today to Sunday, August 5th, 2012. So if you are not a member yet, find us in search, or stop by our in-world store to join up and get your own Hammy Hamster. 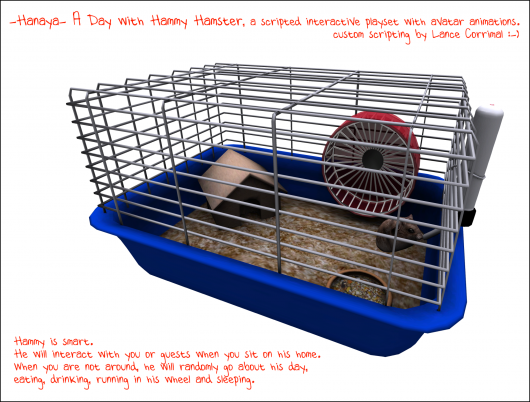 Thanks to custom scripting work by my darling brother-in-law, Lance Corrimal, we are proud to introduce A Day with Hammy Hamster – an addition to your Second Life home or store that is fun to play with. Our smart little hamster, Hammy, will go through his day doing hamstery things – either with you, or all on his own. 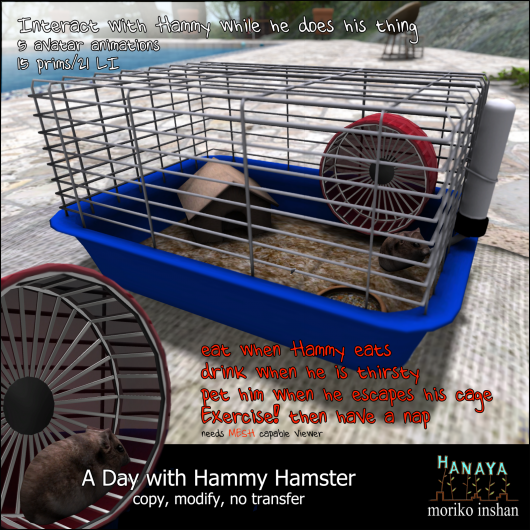 When he is alone, Hammy will exercise on his wheel (which really turns), then hop off and eat, drink and go into his house for a rest. But if you join him, it will be twice the fun, because you get to stuff your face. Or quench your thirst – but with coffee, not water like Hammy. I like the exercise part the best – grit your teeth and do sit ups! When you get tired, have a little nap with Hammy. But be careful, Hammy sometimes gets out of his cage! Our storefront at the Vintage Fair 2012 is all set up and we have lots of brand new products to offer you. Next blog post will feature some of what you can expect from -Hanaya- at the fair. The fair opens on August 4th. This entry was posted in Freebies and Gifts, News on August 1, 2012 by moriko.